What an amazing finale to a very busy few days for Harmon, the eaglet. Critically aware of the risk that bald eagles often abandon a nest after disruption, we all waited and watched yesterday, hoping the parents would return after we replaced the eaglet in the nest Sunday night. By mid-day, we began to consider our next steps, still hoping we would not have to take action. With a fresh US Fish and Wildlife Service special permit for intervention, we headed back out to the nest site. Our friends from MN Bound and Broadband were waiting nearby as we scouted the area late in the afternoon. Jim was the first one to see the adult female near the nest. With her so close to the nest, we began to consider leaving things one more night. We were sure the eaglet was healthy enough to go another night and knew that the female was close enough to deter any predators. While we observed, we were also in contact with staff members watching the web cam. We never had to make the final decision to intervene. At almost exactly the same time that we tentatively planned to take action (7pm), we watched as the adult eagles finally entered the nest. As we celebrated jubilantly, our colleagues gave us a play by play description of the chick’s behavior. Soon, the chick was stuffed with the fish we had left behind on Sunday and settled down for post-meal nap. This morning, the adults have been hunting well, and have brought more food than one chick could eat to the nest. 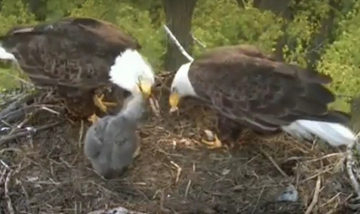 A tremendous outcome for this little eaglet! Thanks to all who helped in so many ways – FWS for special permits on short notice, Broadband for equipment and assistance, TRC staff who worked throughout the weekend and the many nest-watchers who were so supportive. Stay tuned for more stories this week on Harmon’s visit to The Raptor Center. Group Hug to All who played a part in this tremendous Challenge. The World Wide Out Pouring of Love for You All & Wonderful Family Reunion will be remembered forever. Thank You. This has made my heart sing! You all are so wonderful. To think that if that web cam was not there, we would not have ever known of the tragedy unfolding and the awful outcome that would have happened. Thanks so much for your perserverance and knowledge, and for stepping back when the time came for the little one to shine! What an amazing story! My children and I have been glued to the screen rooting and praying for Harmon all the way! We have learned so much through this experience. What an amazing world we live in and what amazing creatures we have the great privilege of observing, encountering, experiencing, etc.! Thank you for all that you at the center did to help Harmon. It is a wonderful outcome to a very heart wrenching situation. It was nice to know that had mom and dad not returned you were on site to save this sweet baby yet once again. Great work! Really admire your team work for this eaglet! My heartfelt thanks go to everyone involved in the rescue of Harmon. It was wonderful to witness the miracle of Harmon being put back in the nest and then readopted by his parents. The love and caring of Harmon’s rescuer was heartwarming to witness. Seeing the wonderful work of The Raptor Center has prompted me to make a donation so that more “Harmons” can be rescued and reunited with their parents. Thank you very much for all that you do. this is possibly the most touching reunion i have watched in years. the raptor center, its employees and all those that assisted 'harmon' in his journey of healing and being with his parents once again are amazing! may he be blessed to continue growing and become a wonderfully strong member of the eagle clan!